Keep the hungry birds coming with the Lyric Delite High Protein No Waste Wild Bird Food Mix. 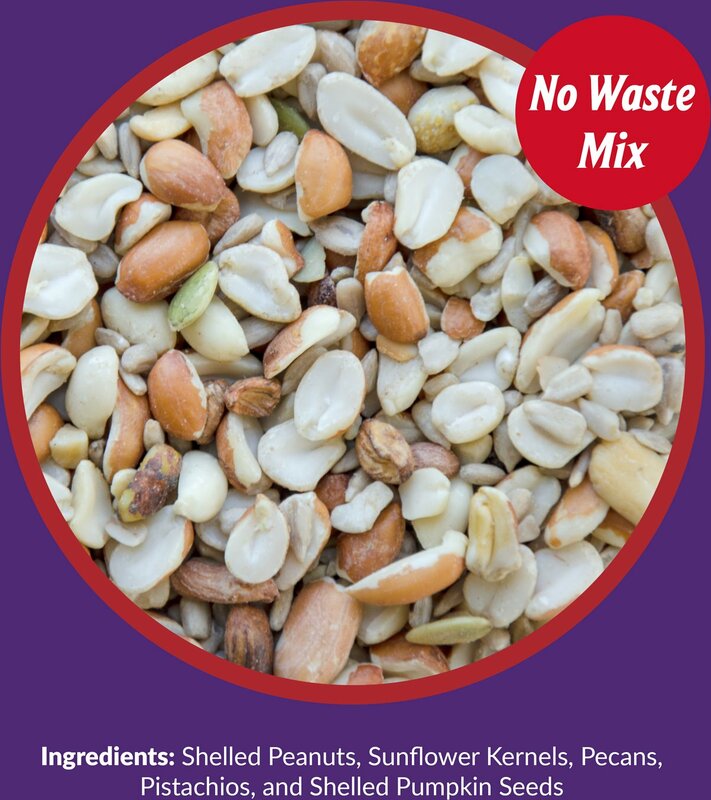 This research-based and field-tested formula is made with carefully selected ingredients to attract a wider variety of wild birds, including shelled peanuts, sunflower kernels, pumpkin seeds and tree nut pieces. It’s 100% edible and each seed is sifted and cleaned so there’s zero fillers, debris, shells or hulls for less mess, clean-up or unwanted weeds from dropped seeds. So fill your feeder and get ready for snack-happy chickadees, robins, orioles, blue jays, titmice, buntings, cardinals, and many more. Packed with a no-waste blend of 100% edible ingredients birds love, with zero fillers or debris. Research-backed formula is carefully cleaned and sifted so it’s free of shells or hulls, which means less mess and no weed growth. Formulated to attract a wider variety of wild birds with nutritious ingredients that are easy for birds to spot. Field-tested blend contains shelled peanuts, sunflower kernels, pumpkin seeds and tree nut pieces. Great for woodpeckers, chickadees, robins, orioles, blue jays, titmice, buntings, cardinals, and many more. Not for human consumption. Not recommended for domestic (caged) birds. Shelled Peanuts, Sunflower Kernels, Pecans, Pistachios, Shelled Pumpkin Seed. I throw a little out back in garden for variety of birds, red squirrels and gray squirrels. ALL is eaten by end of the day. Can't have bird feeders in this complex. I'm super bummed how much money I wasted on this huge bag of "bird food". It is mostly whole (but shelled) peanuts. All my birds are throwing them all over the ground to eat the sunflower chips. If I had squirrels, at least this stuff would get eaten, but I don't so it is high waste for me. This should not be described as birdseed. It is 80% peanuts. Small birds can't eat it so I get blue jays and squirrels. Expensive too. We are now attracting a plethora of beautiful song birds while still keeping our sweet sparrows, and thrushes and blackcap chickadees. Great mix! Previous food used on my 2nd floor balcony was causing sunflowers and other things to grow on the ground below. This food doesn't do that, and the birds all love it! Highly recommend this product. Love this bird seed, but there are a few too many peanuts which the smaller birds don't care for. I get mostly finches and sparrows. I should have listened to the other person who said that. I mostly have smaller birds and will need to mix this with other seeds. I was very surprised with the quality of this brand of bird seed. Lot's of P-nuts that the blue jays enjoy and plenty of sunflower seeds for all the others. BIRDS AND SQUIRRELS LOVE IT!! UNLIKE A LOT OF PEOPLE, I FEED THE SQUIRRELS AS WELL AS THE BIRDS. THEY ALL LOVE IT. IF YOU ARE ONE OF THOSE PEOPLE WHO DISLIKE SQUIRRELS, THERE ARE SEVERAL NO-SQUIRREL FEEDERS AND ACCESSORIES. I HAVE BEAUTIFUL CARDINALS, BLUE JAYS, MORNING DOVES, ALONG WITH MY FAMILY OF SQUIRRELS. THE WASTE-FREE IS WORTH IT, AS THERE IS NO MESS. THE PRODUCT OVERALL IS DEFINITELY WORTH THE PRICE.